Each chapter starts off with a quote that relates to the chapter’s title, along with a funny cartoon parodying the sports industry. A nice little touch that I really liked and it kept me laughing throughout the great read. Part one titled, “The Fundamentals,” begins by Marc explaining the reasons he chose to write a book advising athletes on the fundamentals of the business of sports. It starts with the preface titled “I’m Mad As Hell… And You Shouldn’t Take It Anymore,” which sets up the many chapters of the book and discusses an athlete’s need to be knowledgeable about the draft, agents, owners, players associations, leagues, fans, the media, spending, saving, investing, and preparing for a post-playing career. Chapter one highlights the small number of athletes who actually make it to the professional ranks and congratulates the lucky ones who are in such a position. It continues by discussing three distinct areas an athlete needs to focus on during their pro career: athletically, socially, and financially. Marc ends part one by directing athletes to educate themselves in all three areas, and always have a plan which includes long and short-term goals. Part two kicks off with chapter two, titled “College Rules,” and gives great advice for current college athletes regarding NCAA eligibility during their college years. The chapter discusses agents, NCAA rules and regulations, and gives five don’ts and one do regarding student-athlete activities when enrolled in school. Marc also discusses how the UAAA and SPARTA further regulate agent conduct in many states and elevate NCAA violations to criminal charges. Chapter two continues by giving some examples of situations where athletes got involved with agents during college and how that turned out. Marc finalizes the chapter by giving his best advice to college athletes and continues to accentuate the many reasons athletes should follow the NCAA rules. The next two chapters in part two (three and four) discuss pre-professional financial considerations and an athlete’s decision to stay in school or go professional. Chapter five gives some helpful do’s and don’ts when choosing an advisor/agent. This chapter also discusses agent fees, contracts, marketing, selecting representation, and terminating representation. Part two concludes with chapters six and seven, which provide a great discussion on how the draft works (Marc discusses the draft in all four major sports: MLB, NBA, NFL, and NHL) and how an athlete should approach the draft, seek training and financial advice, and pursue other professional options overseas. Part three is titled, “The Business of Your Life,” and keys in on the initial steps a young athlete is faced with when beginning his professional journey. The very low percentage of athletes who are able to become professionals have many factors to consider, along with performing at a high level in their respective sport. Making responsible financial, social, and ethical decisions will determine the success or failure of an athlete. Chapter eight specifically focuses on getting started in the sports business as a professional. It concentrates on selecting an agent and the process an athlete should go through when doing so, addressing the many factors athletes must consider. The remaining chapters in part three discuss building your team and doing the proper preparation and due diligence to create the best team possible for your future. Part four is titled, “Money Matters,” and hones in on an athlete managing and investing their money responsibly. This section also discusses taxes and estate planning, along with insurance issues athletes should consider. Part five has two chapters that focus on the importance of keeping your mind and body in top shape. These brief but important chapters focus on the choices athletes are faced with that can wear on their body, mind, and reputation. Marc highlights the fact that not many good decisions are made after midnight and mentions that big brother is always watching. Chapter seventeen in part five focuses on gambling and performance enhancing drugs, emphasizing the many ways they can ruin an athlete’s career and reputation. Part six shifts a little and gives guidance into “Today’s Big-Dollar Era of Professional Sports.” Chapter eighteen gives some history lessons to athletes about the different players associations, average league salaries, what a “reserve clause” refers to, and even tells the effect the infamous Marvin Miller had on professional sports. 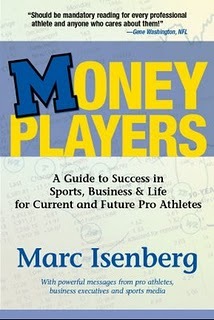 Money Players delves into each players association and discusses their role with players and management. Chapter twenty focuses on the many labor issues both sides deal with on a regular basis and emphasizes the importance of working together to maximize revenue for everyone. This chapter even discuses the “Nascar Nation” model, using fan friendly strategies to compete for public entertainment dollars. Part seven, “Beyond the Field,” guides an athlete on how to relate to the media and fans, getting involved in community activities, and being a role model. Additionally, it discusses the athlete’s rough transition from professional sports into what some call “the real world.” Chapter twenty-one has specific quotes from T.J. Simers, Robert Lipstyle, Art Spander, Fred Claire, Alexander Wolff, Len Elmore, Shelley Smith, and other sports journalists and athletes regarding how the media’s relationship with an athlete can impact their career. The final chapter of the book, twenty-three, uses quotes and insight from agents and athletes to portray how and when an athlete should make the transition to their post-athletic career. Like chapter twenty-one, this chapter uses quotes from others to exemplify how great athletes in the past have transitioned. Hearing from experienced retired players like Curtis Martin, Charles Barkley, Steve Kerr, Ken Ruettgers, and agent and former NFL player Ralph Cindrich puts retirement into perspective and gives athletes great advice for their transition. The final chapter also offers ten challenges of retirement from former NFL player Ken Ruettgers. After only 180 pages packed full of very useful information an athlete is left with more than a fundamental view on almost every important area involved in the sports business. And if that is not enough, Marc adds Appendix A, which gives the “League Information” (contact information, history, average salaries…) and Appendix B, containing “Source Notes” for those who want to delve further into any of the topics discussed in the book. Throughout Money Players, Marc emphasizes the fact that unethical agents or advisors do exist and that athletes should remain loyal and not be tempted by bribes or gifts or any illegal conduct throughout their professional journey. Marc emphasizes that athletes who choose this path will prosper financially and athletically, while others who get blinded by success and money will find out the hard way in the long run. One of the main areas the book focuses on is the importance of being financially responsible and saving money. Marc gives statistics for the average playing career for professional athletes in different sports and accentuates the importance of finding a good financial advisor and setting up a good savings program at a young age. My favorite part about this book is Marc’s use of stories to emphasize his points. Every bit of advice that is given in Money Players is backed up by precedent-setting anecdotes of other athletes. Marc has tremendous knowledge of the sports industry and recalls “sticky” situations between athletes and other in the blink of an eye. The chapters are relatively short and keep the reader entertained with amazing stories and intriguing chapters that focus on key issues for athletes. His ability to apply many different examples in each chapter is what allows anyone to understand this book and the sports business with ease. The book is written mainly for athletes; however, it is applicable to agents, advisors, family of athletes, and anyone interested in learning more about the business of professional sports. I highly recommend that every athlete read Money Players before putting on their helmet, cleats, wrist band, mouth guard, or gloves, and before stepping on any collegiate or professional field. The book offers great tips that can save student athletes’ collegiate eligibility, professional careers, financial and athletic dreams, and lots of money. After you have read Money Players, you can start on Marc’s next book Go Pro Like A Pro. Marc collaborated with former NFL player Ryan Nece to create the company INsight Advisors, under which they co-authored Go Pro Like A Pro, which further educates athletes about making the leap to professional sports. To order a copy of Money Players, click here. Make sure you check out Marc's Money Players blog. This looks like a very educational book and I look forward to reading it! Great review and thanks for sharing, Zak. I am excited to announce two new series of blogs I will begin posting weekly in addition to my normal posts - NBA interviews and book reviews.